Unlike the farm animals that we slaughter by the millions, there's no hard evidence that insects experience suffering. The most convincing scientific defenses of that possibility all concede this point. Of course, there's also no hard evidence that insects don't suffer. I appreciate the argument that we should, in light of this ambiguity, err on the side of caution and avoid intentionally harming them, and I equally appreciate readers reiterating that perspective. That said, I disagree. I'm still going to argue that we have an obligation to harm insects. I'm not going to lay out the physiological data at this point (I'm still gathering and interviewing), but there's enough very strong evidence that insects do not suffer for me to consider the essential competing moral consideration: the untold number of rats, mice, bunnies, moles, voles, prairie dogs, wolves, deer, coyotes, snakes, and, yes, insects, that interfere with the crops grown for vegans to eat. Looking over my previous two posts, and the array of comments that followed, my sense is that this calculus was poorly explained. Let's say insects do suffer. If we honored that suffering by not eating them we'd be lending the same moral consideration to their lives as we would to the obviously sentient animals we kill through pest control to protect plant crops. In other words, out of caution, we'd equate the possibility of suffering (insects) to the fact of suffering (bunnies, deer, etc). That's a risky choice, riskier than readers have considered. But if, taking another risk, we assumed that insects do not suffer and ate them in an effort to offset the production of sentient-animal-destroying plant crops, we'd privilege the fact of suffering over the possibility of suffering. Granted this is not an ideal choice - prioritizing possibility and fact - but it happens to be the one that's in front of us. In light of it, I conclude that we must, even if only in utilitarian terms, eat insects. Vegans too often act as if ethics is easy. It never is. Let me make one more move here. Again, let's assume insects do suffer. A number of scientists and ethicists who have examined this issue (such as Peter Singer) have conceded that, even if this is true, their suffering is not as consequential as that of higher order animals. Maybe suffering has gradations and maybe those gradations need to be considered. This proposition can be evaluated in concrete physical terms. To wit: do you think that a fly swatted with a magazine experiences/suffers the pain of death the same way a farm animal does? My sense is to say no. 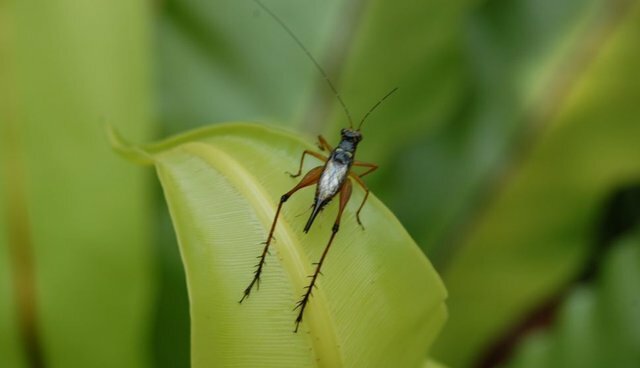 So, even if insects do suffer the experience of pain, the fleeting nature of that pain might very well justify the choice to eat them and, in so doing, offset the suffering of animals who we know suffer when they are shot and churned to death by harvesters to make us feel so incredibly great about eating plants.